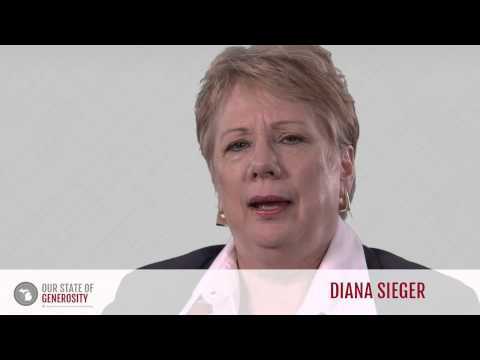 Ms. Diana Sieger is the president and CEO of the Grand Rapids Community Foundation. She has been a board member and chair of the Council of Michigan Foundations and very actively engaged as a statewide leader in many of the major community foundation projects. Ms. Sieger’s vision for using data to support grantmaking led to the creation of the Community Research Institute as a major component of the Johnson Center for Philanthropy at Grand Valley State University. Ms. Sieger has been one of the leading architects and activists of the development of philanthropy in Michigan. Ms. Diana Sieger talks about her career in philanthropy. Ms. Diana Sieger talks about Russ Mawby's remarkable leadership. Ms. Diana Sieger talks about the mission and development of the Johnson Center's Community Research Institute (CRI). Ms. Diana Sieger talks about the importance of driving philanthropic proposals and initiatives with good data. Ms. Diana Sieger talks about the relationship between Michigan's many community foundations. Ms. Diana Sieger talks about the development and successes of the Council of Michigan Foundations (CMF). Ms. Diana Sieger talks about the importance of collaboration in philanthropic work. Ms. Diana Sieger talks about how longevity plays a key role in philanthropic work. Ms. Diana Sieger talks about how family foundations, corporate foundations, and community foundations are all valuable forms of philanthropy. Ms. Diana Sieger talks about the importance of public policy in the philanthropic sector. Ms. Diana Sieger talks about how the nonprofit sector ought not be underestimated in size or force. Ms. Diana Sieger talks about how the success of Michigan's philanthropic leaders stems from their ability to be both fearless and patient. Ms. Diana Sieger talks about Dottie Johnson's remarkable leadership. Ms. Diana Sieger talks about how the passion and big vision of leaders at the Kellogg Foundation led to real philanthropic success. Ms. Diana Sieger talks about the development of national standards for community foundations. Ms. Diana Sieger talks about importance of being a life-long learner. Ms. Diana Sieger talks about how crucial the Branding Project was to strengthening the network of community foundations. In 1973, Ms. Diana Sieger received a Bachelor of Arts degree in sociology from Western Michigan University (WMU), located in Kalamazoo, Michigan. She later pursued a master’s in social work, with a concentration in policy, planning, and administration. She received her M.S.W. in 1978 from her alma mater, WMU. Ms. Diana Sieger was deeply influenced by the social change occurring in her developing years. She grew up in the 1960s amidst the emergence of the Vietnam War, the civil rights movement, and the women’s rights movement. Her parents, who were early role models, allowed her to form her own opinions, and were advocates of open discussion. When she later applied to college, she began many of her essays with, “I want to change the world.” She chose to attend Western Michigan University. Ms. Sieger began her college career studying to be a teacher, but she quickly became fascinated with her sociology courses, which discussed the major issues of her era, such as the civil rights movement. She graduated in 1973 with a bachelor’s degree in sociology. While living in Grand Rapids, Ms. Sieger had come to know Ms. Patricia Edison, the then executive director of the Grand Rapids Foundation (now known as the Grand Rapids Community Foundation). When Ms. Edison retired from her role in 1987, Ms. Sieger submitted an application and was selected as the next executive director of the Grand Rapids Foundation. Since becoming president of the Grand Rapids Community Foundation, Ms. Sieger has implemented a number of key strategy plans, leading to six major community change efforts and an increase in the foundation’s assets from $35 million in 1987 to $260 million in 2012, and now $320 million in 2014. Beyond her many contributions to the Grand Rapids Community Foundation, Ms. Sieger has been a key leader in the philanthropic area of community foundations on a state and national level. Ms. Sieger’s state contributions have largely been through projects at the Council of Michigan Foundations (CMF). Over the years, Ms. Sieger played a crucial role in various CMF initiatives that worked to leverage the collective power of community foundations. Prior to the 1980s, the philanthropic area of community foundations largely focused on building individual and local influence, but starting in the late 1980s, community foundations started to organize around initiatives such as the community foundation strategy team. From the late 1980s through the early 1990s, CMF worked closely with the W.K. Kellogg Foundation (WKKF) to strengthen community foundations in Michigan through the growth of youth involvement in philanthropy. Ms. Sieger was one of the early adopters of the Kellogg Youth Challenge to build the endowment for both the Grand Rapids Community Foundation and for the Grand Rapids Youth Grantmakers Committee. When the Michigan Community Foundations’ Youth Project (MCFYP) was created in 1991 as a supporting organization of CMF, Ms. Sieger became a member of the youth project advisory committee. She later joined the inaugural board of trustees for MCFYP in 1994. One of the major changes stemming from the Branding Project was to include the words “community foundation” in the names of all community foundations around the state, so that potential donors could easily identify them as venues for charitable giving. In 2000, for example, Ms. Sieger supported and oversaw the rebranding of the Grand Rapids Foundation as the Grand Rapids Community Foundation. The common tagline developed by the Branding Project (“For Good. For Ever.”), was also adopted by various community foundations around the state, and was eventually used nationally and internationally. In 2000, under the auspices of the Michigan Community Foundations’ Ventures (MCFV), the project was renamed the Venture Products Fund. Today, Ms. Sieger serves on the board of directors for MCFV (now the Midwest Community Foundations’ Ventures). Another outgrowth of the Branding Project (or Venture Products Fund) was the Community Foundations Standards Project, which had national implications for the philanthropic sector. As chair of the committee on community foundations at the Council on Foundations (COF) from 1997 to 2000, Ms. Sieger participated in early discussions about the development of national standards. In the late 1990s, community foundation leaders recognized the benefits of self-regulation, rather than being regulated by other bodies such as government. In addition, community foundations needed to distinguish themselves from other entities that offer similar services. Together, Ms. Donnell Mersereau and Ms. Sieger served on the standards action team at COF in the early 2000s, and continued to develop standards at the national level. In 2005, the first community foundations were accredited through the national standards project. Today, a supporting organization of the Council on Foundations called the Community Foundations National Standards Board reviews standards for all community foundations that seek accreditation, and there are benefits to being in compliance. Ms. Sieger’s leadership in numerous state and national initiatives, alongside the strong leadership of other visionaries from around the country, has helped to advance the philanthropic area of community foundations and foundations as a whole. In 2006, the Council of Michigan Foundations asked her to chair the board of directors. She held the position from 2006 to 2008. “I am all about really trying to shoulder in and make sure that CMF continues to be the spectacular regional association that it is — not just as a regional association, but a leader in the country and globally,” she said about her position. At present, she is also a member of the board of directors at the Council of Foundations, where she has previously served on the executive committee. More broadly, Ms. Sieger has played a significant role in building a strong vision for using data to support grantmaking. Early on in her career, Ms. Sieger recalls compiling an environmental scanning report. When she began researching for the report, what surprised her most was the apparent lack of any centralized resource that provided data about local economic and social conditions. She turned to a private college, Calvin College, located in Grand Rapids, and poured through reference books such as the Michigan Statistical Abstract and Census data. She said, “I thought to myself, this is crazy … why can’t we have data in one place and social conditions so that we can grab ahold of that?” It was around that time that she turned to the executive director of the Dorothy A. Johnson Center for Philanthropy, Ms. Donna Van Iwaardan, and to another leader at the center, Ms. Margaret Sellers Walker, for their support. Their discussions led to the creation of the Community Research Institute (CRI) at the Dorothy A. Johnson Center for Philanthropy. Outside of her commitments at the Grand Rapids Community Foundation, the Council of Michigan Foundations, and the Council on Foundations, Ms. Diana Sieger also serves on a number of other boards and committees. She has sat on executive committees for the Kent County Family and Children’s Coordinating Council and for Butterworth Hospital (now known as Spectrum Health Medical Center- Butterworth Hospital). In addition, Ms. Sieger has been involved with the Rotary Club of Grand Rapids, Grand Rapids Area Chamber of Commerce, Economic Club of Grand Rapids, Western Michigan University Foundation board of directors, and the Grand Valley University Foundation board of directors. She is also a guest lecturer at various universities and institutes. In recognition of her many contributions to the community, Grand Rapids Business Journal named Ms. Diana Sieger one of the “50 Most Influential Women in West Michigan” in 2004, 2006, 2008, 2010, 2012, and 2014. In addition, she has been named in “Who’s Who in America” by Marquis Publishing from 2004 to the present. Ms. Sieger holds two honorary degrees, Doctor of Humane Letters, from Aquinas College and Grand Valley State University. In 2000, Ms. Sieger was selected as one of ten fellows (five from America and five from Europe) for the Transatlantic Community Foundation Exchange Program. The program was sponsored through a partnership between the King Bedouin Foundation in Belgium, the Charles Stewart Mott Foundation, and the German Marshall Fund. As a fellow, Ms. Sieger had the opportunity to travel to Italy to learn about and discuss community foundations with an international community of her peers. Ms. Sieger was interviewed regarding her insights and experiences in working with Michigan’s philanthropic community and the Our State of Generosity (OSoG) partners. The following are selected quotations from her interview specifically related to the five organizing themes of the OSoG project.